My Mom's birthday is coming up and I'm making her a cake. It happens to be a cake I made in culinary school, and one for which the youngerchild has been begging. I don't have a billion pots and pans and mixers at my disposal, nor do I have a ton of time in large chunks, so I'm making it in stages. 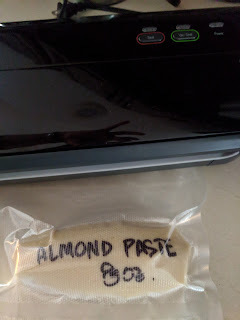 Today, I made almond paste. In class, I'm sure, we just opened a can of almond paste. I don't have almond paste but I do have almond flour and the internet. 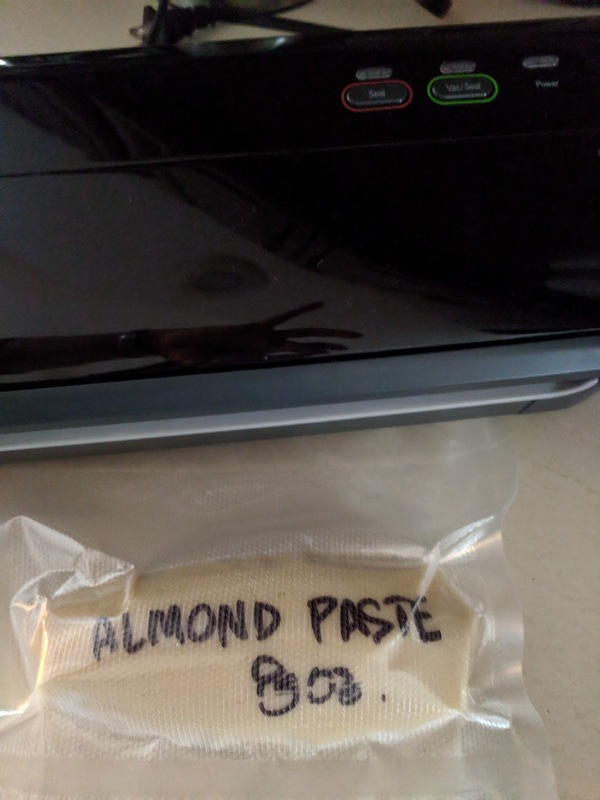 I found this recipe for making almond paste out of almond flour. Now I have just over 12 ounces of almond paste. I set aside what I needed for the cake and then the remaining 8 ounces were wrapped in plastic wrap. Could I freeze it? Back to the internet! The answer is yes, if it's packaged properly. Time for me to use my new toy, the vacuum sealer. That was my Christmas present this year. It's super easy and this is the perfect use for it.